The interconnectedness of today’s world can hardly be over emphasised. Political, economic and social effects of actions in a particular part of the world spiral out of control, leaving none of us anywhere untouched. There are many countries which have gone through a period of military rule en route to ‘democratic’ aspirations. In South Asia, Pakistan has been one of these examples. There are no straight parallels, but the quickly changing events in Egypt also point to a wider debate about ‘fledgling democracies’ and ‘struggling democracies’. Egypt has been under militarised rule since 1952. In 2011, the uprising against Hosni Mubarak saw the Muslim Brotherhood come to power. In 2013, the Egyptian army ousted the first civilian President of the country, Mohammed Morsi. While the geostrategic context has been different, both the Pakistani and Egyptian armies have wielded state power for extended periods of time. With support from the United States and key European countries, they have entrenched themselves in the national economy through authoritarian methods and the pursuit of externally stimulated development policies. But whereas the Egyptian army has remained at odds with Islamist parties like the Muslim Brotherhood, the Pakistan army for strategic reasons forged an alliance with the Jamaat-i-Islami after 1977 and, following the Soviet invasion of Afghanistan, also with groups like the Deobandi orientated Jamiat-i-Ulema-i-Islam. 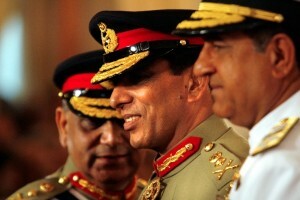 There could be warnings for the Egyptians in the Pakistani military model. The army invariably intervenes in the name of saving the country from corrupt and inefficient politicians but ends up staying at the helm to ensure its own institutional interests, political, economic and strategic. To think that an army seizes state power to protect and promote democracy, as many Pakistanis believed in 1999 at the time of Musharraf’s coup, is a fallacy that Egyptians would do well to take serious note of. The current discourse around Egypt has been that of a great schism between pro-military, anti-military, pro-Morsi, and anti-Morsi supporters. However, we can not afford to pin it down to such simplistic divisions. The situation in Egypt is far more complicated than an anti-military and pro-military divide between Morsi’s supporters and opponents. To see it in such terms would be as detrimental to Egypt’s democratic future as it proved to be for Pakistan when people felt they had to choose between General Musharraf’s ‘enlightened moderation’ and the Taliban’s benighted rule. Egyptian General Abdel Fattah El Sisi, the head of the army, has now urged Egyptians to strengthen a military “mandate” to stop what he called “violence and terrorism”. According to the Health Ministry of Egypt, the deadly clashes this weekend took 72 lives and injuring hundreds. 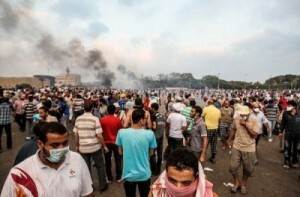 Human Rights Watch condemned the violence, stating “a shocking willingness by the police and by certain politicians to ratchet up violence against pro-Morsi protesters,” in its report. Today’s Egypt is reminiscent not so much of the days of Ayub’s guided democracy as of Musharraf’s ‘Pakistan first’ rhetoric that equated the perpetuation of the general’s rule with the battle against extremists operating under the umbrella of the Tehrik-i-Taliban Pakistan (TTP). What Pakistanis got in the process was another extended bout of military authoritarianism and more internal instability, violence and uncertainty than they had ever witnessed before. Democratic transitions following military rule are inherently messy. The civil-military nexus in Pakistan remains strained even after the recent elections resulted in the first constitutional change from one civilian government to the other. The army still calls the shots on foreign and defence policies and has considerable say in internal security matters. Only time will tell whether the newly elected government of Mian Nawaz Sharif has learnt from mistakes made during its previous term and will strengthen elected institutions, most notably parliament, without provoking the army to take over. The prognosis is not altogether hopeless. Unlike the past occasions, Pakistan today has an assertive judiciary; a vibrant media and a vocal if divided civil society that are bound to oppose any unconstitutional move by the army. But the ability to prevent a military coup does not necessarily translate into civilian supremacy. The problems plaguing Egypt are rooted in the authoritarianism embedded in the state structure and the kinds of patronage networks the military high command has created for the benefit of sections of the dominant social classes. This system has clearly not worked for the vast majority of Egyptians who demonstrated this failure by taking to the streets and bringing down Mubarak. It was clear then that the downfall of Mubarak did not mean the end of his regime’s entrenched interests in Egypt. Without uninterrupted democratic processes, and the emergence of political parties with strong links at the grassroots, it will be impossible for Egyptians to reverse the army’s supremacy and establish an elected government that is both responsive and accountable to the demands of the people. Egypt is most definitely on the brink, which way it goes from here, is up to its people to decide. This is a disappointing article which is gratuitously offensive to Egyptians whose country was not ‘created’ by the departure of the British as Pakistan was (there was once an East + a West Pakistan too). In fact, they were oppressed by Britain every time the Suez canal was imagined to be under threat. Now they need a strong military to protect themselves from Western interference, just as Syria does. Apart from that, the Muslim Brotherhood is a historically violent organization which is not trustworthy + has vowed to revivify its ‘military wing’ of terrorists. The Egyptian people have already declared en masse that they don’t want to be ‘ruled’ by Morsi as a self-styled pharaoh ignoring their democracy with the Brotherhood’s agenda of re-creating a 7th century caliphate under sharia law. Thus the military have stepped in to ensure security + stability. It was not necessary to wait pedantically for another ‘official’ election after the huge popular protests. What has changed, though, is that the USA is no longer able to manipulate the Egyptian military as they once did with Musharraf’s Pakistan. Times have changed + there have also been massive protests against Erdogan’s Muslim Brotherhood regime in TURKEY as it too begins to fail through ignoring the will of the people for its own dubious agenda. Absolutely timely piece…Can not believe people still buy into the “innocence” of a military-role in civilian affairs. So everytime, an elected government does not please the people, they would be brought down and hunted like Morsi is now? Why hold elections then? This is no solution to Egypt’s problems. Insightful article. egyptians will have to defeat islamists, foreign forces and the military to get out of current impasse. Interesting piece….egypt beware of army which will have secure its interests by whatever way possible…. Ayesha Jalal is a renowned South Asian historian. She is the Mary Richardson Professor of History at Tufts University and a 1998 MacArthur Fellow. She has also taught at Harvard University and Columbia University. She has won the Prize Fellowship from Trinity College, the MacArthur Foundation Fellowship and the Sitara-i-Imtiaz, one of Pakistan's highest civilian awards in 2009.